Elizabeth Van Lew is true to her southern roots. Yet when delegates in Richmond, Virginia vote to secede from the Union, Elizabeth cannot bear to contribute a stitch to Confederate sewing circles. How can Lizzie aid President Lincoln? After hearing of bloodied battles, Lizzie discovers that local prisoners of war live in squalid conditions. The food is inadequate. Blankets are nearly nonexistent. Wounds are often left to fester and worsen. Intrepid and creative, Lizzie and her mother bake their way into the prison, bribing guards to reach those behind bars. Soon Lizzie is smuggling messages to and from imprisoned leaders. As the war continues, Lizzie must protect her family from possible deadly repercussions. She holds dinner parties for Confederate leaders to obscure her true allegiance. 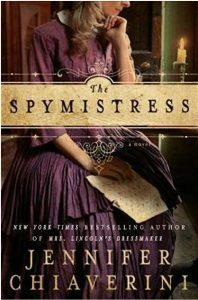 She enlists the help of a freed black woman to ferret out military secrets within the Confederate president’s home. Lizzie and her mother have a secret room built in their mansion. They temporarily house runaway prisoners and slaves. Also, Elizabeth is introduced to a network of other spies in Richmond. Together, they smuggle, confound, and plot for the sake of the Union. Although this is a fictionalized account, Elizabeth Van Lew was an actual person in history. Through her eyes, the reader experiences this unique time in which our country was fiercely divided in its loyalties and devastatingly bloody in its consequences. And look! It’s in our catalog!